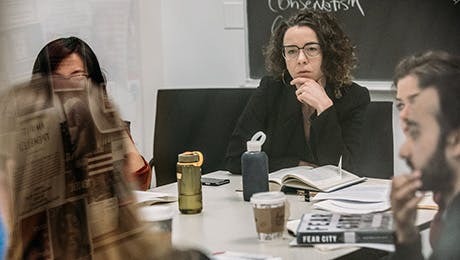 Each year, The New School for Social Research accepts as visiting students a small number of highly qualified applicants enrolled in universities outside of the United States. Applicants admitted with this status may enroll for either one or two semesters and are expected to register for the equivalent of a full-time course load (i.e., three courses, or nine credits per semester). If subsequently admitted to a New School for Social Research degree program, these students may petition to have credits earned during visiting student study applied to the degree program. New School financial aid is not available to visiting students unless they are admitted as part of an official exchange agreement between The New School for Social Research and an overseas university or funding program. Form. A completed application for the visiting student program must be filed with the Office of Admission at The New School for Social Research. Recommendations. Two letters of recommendation are required; forms are included in the application packet. When possible, recommendations should be from faculty members who have instructed the applicant in the field in which he or she plans to study. Transcripts. An official transcript from each undergraduate and graduate institution attended is required. Only official transcripts will be accepted. Certified English translations must accompany all transcripts and records that are not written in English. Statement of Purpose. 500-750 words stating your academic goals and how a period of visiting study will help meet those goals. TOEFL, IELTS, or PTE Results. See our International Applicants page. Fee. A nonrefundable application fee of $50 must accompany the application form. Because of the time required for processing documents, a visiting student application cannot be considered unless it is completed at least two months prior to the start of the term for which the application is submitted.